I’ve often said that if I could turn back the hands of time and witness a single event of the Civil War, it would have been the grand, five brigade front charge by the Union cavalry that won the Third Battle of Winchester on September 19, 1864. The charging Union line was fully two miles long, and the accounts of the veterans indicate that the ground trembled like an earthquake as those 9,000 troopers came pounding down on Jubal Early’s Confederate infantry at Fort Collier. 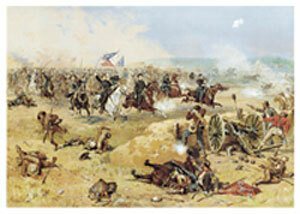 The Thur de Thulstrup illustration that you see here is a depiction of that magnificent charge. Is it any wonder that I find cavalry operations so fascinating? Keith Poulter of North and South magazine has been soliciting a raft of new articles for upcoming issues. Last weekend, Keith asked–and I agreed–for four articles from me. Fortunately, three of the four are things that can be adapted from different book projects. One of them will be an article on the June 30, 1863 Battle of Hanover, adapted from Plenty of Blame to Go Around: Jeb Stuart’s Controversial Ride to Gettysburg. JD’s doing the bulk of the work on that one. Right now, I’m working on a piece on the March 17, 1863 Battle of Kelly’s Ford. This one is an adaptation of a chapter from The Union Cavalry Comes of Age: Hartwood Church to Brandy Station, 1863. The problem is this: the chapter from the book was nearly 19,000 words long, by far the most detailed treatment of this day-long slugging match ever published. It’s literally filled with great stories of the deeds/exploits of individual troopers. Keith asked for 7000-7500 words. That means, in order to meet his target length, I have to cut nearly 60% of the text. I’ve taken two full runs at it so far and have managed to cut about 8000 words, meaning I’m presently at about 10,500 words. I still have to write several introductory paragraphs for it to put it in its proper context. I’ve cut out virtually all of the individual soldier stories and have just the battle narrative left and some analysis at the end of the article, although there’s much less of it than there was at the end of the book chapter. I don’t see any way that I can get it down to the target of 7000-7500 words without pretty much eviscerating the thing. I might be able to cut another 500-1000 words before writing the introductory paragraphs, but that’s it. I guess I will have to leave it to Keith to either cut more out of it or to simply run with it the way that it is. And then I get to do the same thing all over again with the two days of the Battle of Trevilian Station. That will be even more difficult…. Over at the excellent group blog Civil Warriors, and citing my ruminations about whether to obtain an advanced degree in military history, Brooks Simpson has chimed in with a very thoughtful and well-stated analysis of the sticky question of amateur vs. professional historians. I think that Brooks has it exactly right.Â It shouldn’t be about degrees and professional designations, but rather about whether one produces quality work, based on solid research, that adds to understanding and to theÂ body of knowledge.Â I couldn’t agree with that more.Â Ultimately, whenÂ push comes to shove,Â the work ought to be able to stand on its own and speak for itself.Â I hope that when my time comes, people will be able to say that my work met those criteria.Â If it has, then it doesn’t matter whether I had a Ph.D. in history or a law degree. The whole “publish or perish” thing that faces a lot of academic historians has to be a tough row to hoe.Â I guess I’m fortunate to have the time and motivation to do this work and NOT have my professional life at stake as to whether I get something published or not.Â For me, the very fact that I am not an academic historian gives me the freedom to work at my own pace and to focus only on those things that interest me, as opposed to writing for some dry, dusty academic journal because it’s what’s expected of me as part of my job requirements. J. D. Petruzzi has also tackled this issue on his blog today.Â Here’sÂ his take: In the end, I think the distinction between â€œprofessionalsâ€ and â€œamateursâ€ in the field is important to only a very small segment.Â Most folks donâ€™t think about such a distinction, probably never heard of it, and donâ€™t care one way or the other.Â When it comes to books and articles, folks will read what interests them and ignore what doesnâ€™t, regardless of who the author is or his/her credentials.Â The readerâ€™s level of familiarity with the subject, and reviews, will allow them to assess the writingâ€™s value and scholarship.Â I also tend to agree with this as well. I will be the first to admit that my insecurity and bristling about being labeled an amateur has everything to do with my own personal foibles and very little to do with the opinions of others.Â It’s important to me for my work and meÂ to be taken seriously and to have the respect of those whom I consider to be peers, and I tend to be a little thin-skinned about this particular issue because it plays to my own insecurities.Â There have been some academic historians who have turned up their snoots at my work, and that has offended me to no end and has caused a great deal of the insecurity that drives this particular bogeyman for me.Â I think it’s time to get over it and move on. In the end, I think thatÂ Brooks, Kevin,Â and J. D. have said pretty much the same thing in different ways.Â They’re right–there’s no reason to go looking for a fight when there’s not a fight to be had.Â Ultimately, it’s all about the work and letting the work stand on its own merits, and I have to remind myself of that from time to time. In 1971, when I was ten years old, I met Muhammad Ali at a hotel in Philadelphia. We were there for some family occasion, either a wedding or a Bar Mitzvah. I honestly don’t remember which; it’s been 35 years, after all. It was just a few months after his legendary first fight with Joe Frazier, in which he took a beating and lost to Smokin’ Joe in what is often called “The Fight of the Century”. Ali took time to sit and talk to me, a Jewish kid from the suburbs, and sat me in his lap while he did. He signed a postcard for me twice–one in his normal signature, and once in what he described as his “pretty” signature. I still have that postcard. It’s in a photo album upstairs, along with the rest of my collection of sports autographs. It’s one of my prized possessions. From that moment on, I became a boxing fan. I love watching boxing. There’s nothing like it in the world–one-on-one combat. Just two boxers in the ring with nothing but their skills and their wits, and may the better man win. Some view it as barbaric. I view it as a thing of beauty. I’ve become something of a student of the game, but with so many weight divisions and so many governing bodies with so many watered-down championships, it’s difficult to keep it all straight. Still, though, I thoroughly enjoying watching a good fight. Last night was devoted to boxing. Columbus is a pretty good boxing town. This is Buster Douglas’ home town, and Jerry Page, 1984 Olympic gold medalist has spent his entire life here. When Buster went through the motions of training for his only title defense–a loss to Evander Holyfield–I would see him running in the neighborhood where I lived at the time. Buster could have been a great one, but he had only one great fight in his heart. He just didn’t want it badly enough to be able to muster more than that one truly magnificent fight against Mike Tyson. A local boxing promoter had a slate of professional bouts last night, and a client of mine sponsored the event and got ringside seats for doing so. My client knows I love boxing and invited me to come along. Susan and I went and saw eight fights. We then got home and saw a bout and a half on HBO. For a boxing fan, it was a great evening. While driving home, I started thinking about what might have happened if some of the leading protagonists of the Civil War had donned the gloves. Just for fun, I started coming up with some pairings. Here are a handful of them. In a heavyweight match, veteran defensive specialist and counterpuncher James “Old Pete” Longstreet takes on Winfield Scott “Winnie” Hancock, the aggressive but effective slugger from Pennsylvania. In a middleweight bout, James Ewell Brown “Beauty” Stuart, the flashy and speedy technician, meets John “Old Reliable” Buford, the steady and hard-hitting fighter who is equally proficient with both hands. William T. “Cump” Sherman, the enigmatic and inconsistent tactician, takes on defensive specialist Joe Johnston, who specializes in the rope-a-dope, in a welterweight match-up. George “Slow Trot” Thomas, slow-moving but hard-hitting, takes on grizzled and unpopular veteran Braxton Bragg in a contest of two journeymen. Judson “Little Kil” Kilpatrick, small, wiry, and aggressive, and clad in only his nightshirt, takes on big, hard-hitting veteran Wade Hampton in a seemingly uneven match between different weight classes. And, in the main event, Robert E. “Gray Fox” Lee, the crafty, unpredictable and hard-to-hit veteran southpaw takes on Ulysses S. “Butcher” Grant, the aggressive and relentless slugger from Illinois, in a twelve-round title match. Feel free to add some match-ups of your own. It really is a lot of fun. I keep seeing advertisements for Norwich University’s on-line Master of Arts in Military History in all of the Civil War publications. Norwich is very much like VMI or the Citadel–it has a long and glorious history of training citizen-soldiers for the United States Army. I am keenly aware that I do not have any academic background in history. I have not had a formal history class since the tenth grade, meaning that I am entirely self-taught. As I said, I am keenly aware of my lack of academic training in my chosen field of pursuit, and I often feel inadequate about it. I think it’s because I don’t much care for being described as an amateur historian. I had a good long look at Norwich’s program tonight, as I’ve been curious about it. All but the last week of the program is done on line, though distance learning technology (which has really come a LONG way). The degree track is 36 credits, to be completed over 18-24 months, with a capstone project to be done at Norwich’s Vermont campus. I wasn’t particularly impressd with the course selections. They’re pretty much all survery courses with no opportunity to really hone in on a particular area of study or pursuit, and that surprised me. There are a lot of theoretical courses that simply don’t hold much interest for me. It thus becomes a two-fold question: is it worth the investment of (a) time and (b) money? I already have three degrees. I don’t talk about it much, but I already do have a master’s degree, in international affairs, with a concentration in international security studies. I actually did a four-year dual degree program with law school. I therefore don’t feel a compelling need to get another degree just for the sake of getting another degree. It therefore has to be worth my while for me to really consider it. There’s also the fact that come June, it will be 20 years since I got my two advanced degrees, and it would really take a major adjustment to get me back into the swing of being a student again all these many years later. I took a good look at the curriculum, the expense, and the time investment required and ultimately came to the conclusion that it’s just not worth pursuing for me. I have so little free time as it is that I can’t get too fired up about investing 15-20 hours per week of time that I really don’t have into a degree that ultimately has little utility for me and which won’t really do much to make money for me. In addition, the nature of my job is such that really busy times come in waves and are often impossible to predict. As set forth above, the curriculum really didn’t much excite me, and I can’t really justify the financial investment. I have, therefore, come to the conclusion that this is not for me. It may very well be worth it for some, but for me, it’s just not. I am glad, though, that I indulged my curiosity and took the time to check it out. At least now I know what’s involved and have satisfied myself it’s not for me. And there is value in that. A fellow named Tony Larson posted several comments on this blog today. Mr. Larson appears to be a first-time poster, and his comments were very interesting. Mr. Larson’s blog exists to support Republican causes, and this is a VERY blue blog. I won’t hold Mr. Larson’s political beliefs against him, as his comments directed me to a Civil War cavalry regiment I had never heard of previously. The comments, which can be found appended to this post, provide profiles of several Republican politicians who were Civil War veterans (including William P. Lord of the 1st Delaware Cavalry, who was mentioned in my profile of Maj. Napoleon Bonaparte Knight). One of those comments referred to the 1st Oregon Cavalry. I had never heard of the 1st Oregon Cavalry prior to read Mr. Larson’s comments this evening. The First Regiment, Oregon Cavalry was a regiment in the volunteer Union army that participated in the American Civil War. With many men recruited from California, the regiment primarily served to protect the state of Oregon and surrounding territories in the Pacific Coast Theater of the American Civil War. The initial part of the regiment (companies A through F) was organized and mustered into the army in Oregon from February to April 1862. In May 1862, it was sent into the Washington Territory to the Walla Walla country to protect immigrants and miners along the Salmon River. The 1st Oregon occupied Fort Walla Walla in June 1862 and sent out various expeditions over the next two years to fight the Snake Indians and other threats. Hence, the regiment was rarely intact as a single unit for much of the war. Several companies scattered to other frontier forts, including Fort Vancouver and Fort Dalles (see also The Dalles, Oregon) for detached duty such as constructing roads through the wilderness. In January 1863, the remaining portion of the regiment (companies G, H, I, K, and M) were authorized and activated for duty. Companies G and H served at Camp Watson on Rock Creek, Oregon; Company I was at Fort Klamath, Company K at Fort Dalles and Companies L and M at Fort Boles in Idaho Territory. The battalion came together for several skirmishes in the Harney Lake Valley and other locations with local Indians. In January 1865, Col. Reuben F. Maury, 1st Oregon Cavalry, assumed command of the Federal District of Oregon. 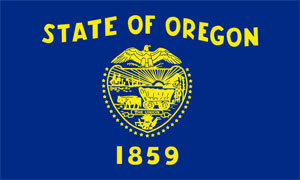 The 1st Oregon Cavalry mustered out November 20, 1866. Until this evening, I never even knew that this regiment existed. Never mind that it never fired a shot in anger at a Confederate soldier. They were still Union cavalrymen and entitled to recognition as such. Thank you for making me aware of this regiment, Mr. Larson.